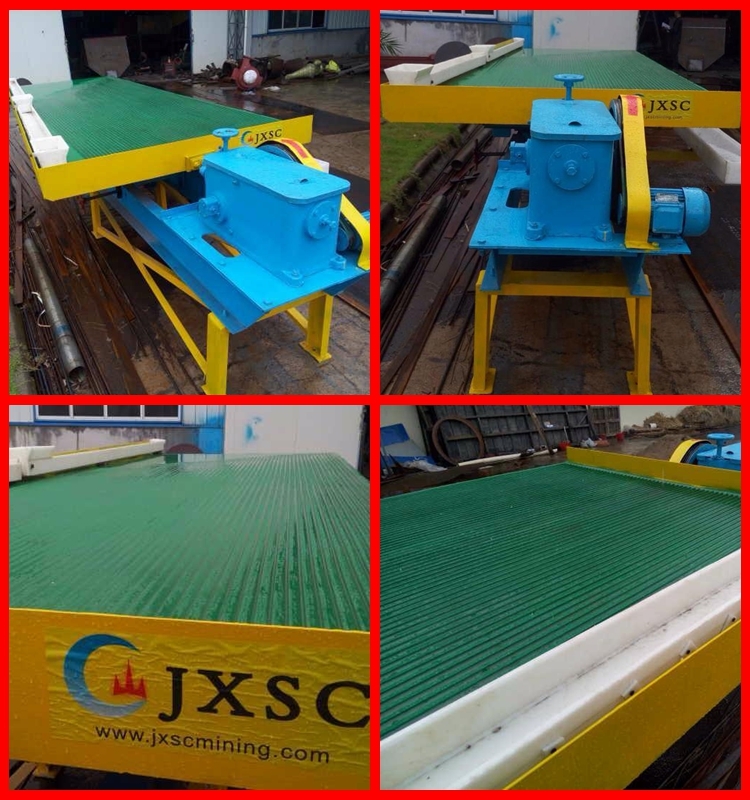 6S gold shaking table, which is also called table concentrator, is a mine separation device for fine minerals working by gravity. They are effective in processing precious and base metal, rare metal and non-metallic minerals, widely used in separation for Gold, Silver, Tin, Columbium, Tantalum, Titanium, Barium, Tungsten, Iron, Chrome, Manganese, Zircon, Lead, Zinc, Mercury, Copper, Aluminum, etc. 6S gold shaking table is furnished with a totally enclosed self-oiling head motion of heavy cast iron to contain an oil reservoir for perfect splash lubrication.This feature protects the moving parts, reducing operating and maintenance costs to a minimum. The decks are constructed of steel framework and covered 16mm fibreglass with corundum, this cover its strength reaches as high as 70% of steel, the features of this design are stronger, wear-resistant, corrosion-resistant, and no distortion, it lengthens the working-life of machine and thus allows machine perform perfectly on different mineral and different weather condition. Support types Traditional type, groove steel support or big channel steel support are available. Feed and Water Box A wooden feed distributing box with hopper and a long water box are attached to the iron of the deck, giving a very even distribution of feed and water. Base A choice of ordinary type, groove steel support or big channel steel support is available.